No final result has yet been announced, but unofficially the Albanian Democratic Party has won the parliamentary elections of June 28th. Almost 50 percent of registered Albanians voted. The Democratic Party took 68 seats of 140. In coalition with two other right-wing small parties, it has 70 seats. The result of these elections is a split Parliament that can hardly be called stable. The difference between the two major parties was so small that the result was almost a draw. The new electoral system adopted in December 2008 was proportional on a regional basis, with the country divided between twelve regions. The small parties, which for more than 18 years have been part of the Albanian parliament, didn't have a chance to get in. In some regions a Party needed almost 20 percent of the votes to get one representative. The intention of this system was to produce a stable parliament and government with no small parties. Some called this system discriminating, as only five parties made it into the new Parliament. Now only one representative of these small parties will have a chance to make a difference. Despite this streamlining of the country's political parties, these results have created a parliament that is more unstable than before. This situation has forced a coalition between the right-wing Democratic Party and the left-wing party Socialist Movement for Integration (S.M.I.). Other left-wing parties have gone so far as to call this coalition immoral. S.M.I. Chairman Ilir Meta, during interviews with local media before the elections, said that a coalition with the Democratic Party of Prime Minister Sali Berisha was impossible. During the electoral campaign, he assigned all the problems that Albania faces today to the government headed by Berisha. This coalition will be a hard test for the Albanian democracy. Berisha, whose party won, said that these were the best elections Albania has ever had. 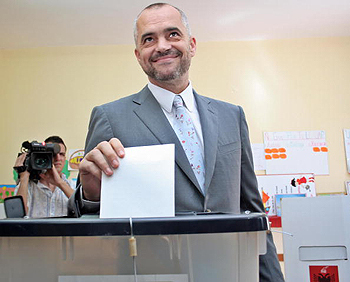 On the other side, Socialist Party Chairman Edi Rama criticized the election process, saying that the standards required of a country that is now part of NATO were not achieved. Rama said the process had a lot of problems, especially during the counting of votes. During a joint press conference after the elections, the international election observer missions said that the expected standards were not fully met but that progress was made. "The country has matured, it has made progress, and many of the fears we had only some months ago have not materialized," said Wolfgang Grossruck, vice-president of the O.S.C.E. Parliamentary Assembly and Special Coordinator of the O.S.C.E. short-term observer mission. The election operation, which was redesigned for a more transparent process, suffered only a few problems. The counting process proved difficult, using technology that had not been implemented before. Cameras were installed in every counting room and every vote was scanned before counting. The new I.D. cards were problematic in some cases, but in general the elections process, technology and the I.D. cards were a mark of major progress. The ordinary citizens of Tirana are split in their opinions about the elections. If they favor the winning party, they tend to view the elections as a great result with standards being achieved. Some of them say that Albania has held the best elections since the fall of communism in 1991 and that this demonstrates the merit of the democratic government. On the other hand, people who favor the Socialist Party tend to view the process negatively. They emphasize the flaws in the process, such as the I.D. cards not being equally distributed and the counting process resulting in conflicts—as in the case in Fier and the allegations for stealing votes in Shkodër and Berat, respectively. These elections showed that Albanians remain evenly divided on their political preferences, even though the two major parties had little differences in their programs. European integration and visa liberalization with E.U. were two major issues during the electoral campaign, but a poll conducted by Zogby International showed that Albanians are little influenced by the campaign. The voting in general is based on regional and leadership preferences. The leaders of two major parties dominated the election, leaders who spent more time during the campaign singing songs about the need to change Albania than talking about real issues that can bring change to the country. In the new Albanian Parliament, 55 percent will be representatives who were never before part of it. Also, 15 percent of the 140 seats will be female representatives. The law approved in December 2008 predicted that 30 percent of the 140 representatives have to be females, but the law was bypassed by the political parties. The new Parliament will have more jurists, economists, businessmen and journalists. "Greater efforts still need to be made by all political forces in order to meet demanding international standards," said Bruce George, head of the delegation of the NATO Parliamentary Assembly.